At Bookstein’s new uptown location, the open gallery room invited comparison of these connected compositions, all from the past three years. Among the circles and triangles, the sea and ­the sky, Resika finds a great range of feeling in shapes and tone. Rose Dawn (2017) crackles in a morning sun. Red Dunes, Green Sea (2016–17) bakes in a sun-scorched afternoon glow relieved by the sea water pooling into a triangle below. The yellow sun of The White Sky (2017) breaks through a damp mist, while Red Sun (De Chirico) (2017), with its vertical symmetries, conveys the meridian sun with a nod to the surrealist master. 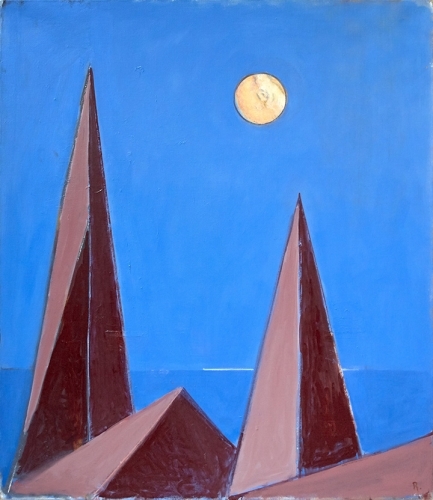 Meanwhile, Blue Night (2017) turns day to night with the coolness of moon-shade, as pyramidal forms grow ever taller in the dream-lit air. In his intimate downtown space, Steven Harvey looked to the poetry of Resika’s mysterious forms and their spare surroundings. A Quiet Romance (2017) features a circle and a shell in conversation over a field of blue. The White Moon (2017), Celadon Sea (2017), and Blue (2017) convey Resika’s interest in sensuous, mottled color. In a gallery filled with natural light—as it must be, for Resika’s colors—the illumination from the storefront window highlighted the textures of Resika’s layered surfaces. These latest paintings are often painted over older work, and the pentimenti add to the mystery of the compositions. Self-Portrait with Rag (2017) depicts Resika emerging from the color-rich mist. The great painter looks out as both an abstract vision and a concrete form. Panero, James. “Gallery Chronicle,” The New Criterion, June 2018. Vol 36, No 10. p. 53-55.